Even as the ticks that transmit Lyme disease expand their geographic range, the pathogens that actually cause Lyme disease retain their ability to spread infection within the body while remaining, all too often, under the diagnostic radar. Lyme disease, according to the Centers for Disease Control and Prevention, could be 10 times more common than we know—and we already know that about 30,000 cases of Lyme disease are reported each year. Early diagnosis of Lyme disease is critical in guiding treatment and preventing complications, which range from arthritis, meningitis, facial palsy, and, in rare cases, myocarditis, or damage to heart muscle leading to sudden death. But Lyme disease can hide during the “window period” of infection prior to the appearance of a detectable antibody response. To deny Lyme disease this window period, scientists based at the University of California, San Francisco (UCSF) decided to look for signs of Lyme disease not in the antibody response, but in the transcriptome, which amounts to the full range of messenger RNA molecules that is produced by a particular cell or tissue type. The UCSF scientists, led by Charles Chiu, M.D., Ph.D., used a next-generation sequencing technique, called RNA-seq, to investigate the transcriptome in peripheral blood mononuclear cells. In the white blood cells of patients infected with tick-borne bacteria, the scientists found a distinctive pattern in the transcriptome—a gene expression signature. The details of this work appeared February 12 in the journal mBio, in an article entitled “Longitudinal Transcriptome Analysis Reveals a Sustained Differential Gene Expression Signature in Patients Treated for Acute Lyme Disease.” The article describes how the tesearchers examined 29 patients before and after they received a three-week course of antibiotic treatment and also six months later. Compared to patients with other active bacterial or viral infections, the Lyme disease patients had distinctive gene signatures that persisted for at least three weeks, even after they had taken the antibiotics. Some differences in the transcriptome lingered for six months. Researchers found similarities between the transcriptional changes after Lyme disease infection and other diseases. The acute phase of Lyme disease infection had similarities with influenza. At six months, the gene signatures of Lyme disease patients showed some similarities to those from patients with immune diseases like systematic lupus erythematosus, rheumatoid arthritis, and chronic fatigue syndrome. “To our knowledge, this study is the first to document changes in gene expression occurring even after a bacterial infection has been treated with appropriate antibiotics,” said John Aucott, M.D., assistant professor of medicine at the Johns Hopkins University School of Medicine and a senior investigator on the study. The discovery of a gene expression signature of Lyme disease is especially welcome in light of a finding, reported last month in the Journal of Medical Entomology, that the range of Lyme disease–carrying ticks is spreading. 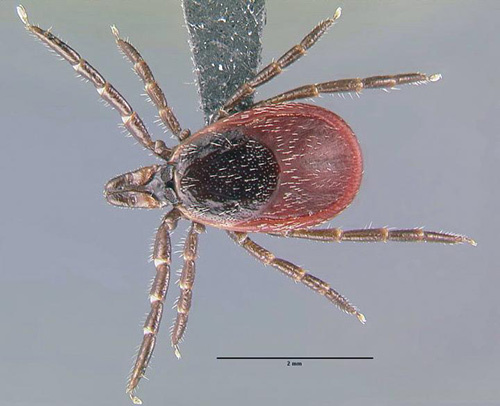 This report focused on the blacklegged tick (Ixodes scapularis) and the western blacklegged tick (Ixodes pacificus) and indicated that these species were more widespread than they were two decades ago, the last time a major survey had been conducted. The new survey found that the blacklegged tick has been reported in more than 45% of U.S. counties, compared to 30% of counties in 1998. Even more alarming, the blacklegged tick is now considered established in twice the number of counties as in 1998. Most of the geographic expansion of the blacklegged tick appears to be in the northern United States, while populations in southern states have remained relatively stable. The range of the western blacklegged tick only increased from 3.4% to 3.6% of counties.